Injuries are generally caused by a combination of the following factors: trying to do more than you’re capable of; falling at high speed; tiredness; landing badly after a jump; collisions and sudden changes of direction. Faulty equipment or equipment that is used incorrectly can also be a cause of accidents. Of course, accidents can happen however there are some things that you can do to reduce the chances of them occuring. Exercising in cold weather puts extra strain on your muscles, joints and ligaments so it is vital to warm up thoroughly before heading out on the slopes. Ideally, it is a good idea to undertake a conditioning programme for six weeks prior to heading off on holiday to build up your fitness levels and get your muscles used to working hard. Weak, tired muscles provide less protection for joints and make them more prone to injury. Listen to your body when you are out on the slopes and know when to stop. If you are tired or in pain you are most susceptible to accidents and injury. Wearing the right protective gear in the right way will also help to prevent injury. Be sure to check your equipment thoroughly to make sure it is functioning correctly. The National Ski Patrol recommends wearing a helmet while skiing or snowboarding and properly fitting ski boots are essential with adjusted bindings that fit to the skis or snowboard. 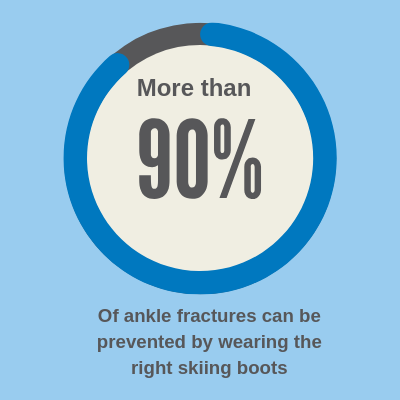 Did you know that you can minimise ankle fractures by up to 90% by wearing modern ski-boots with a high, rigid shell. Dress for the wintery conditions in layered clothing that will help you to stay warm. Wicking materials worn against the skin (polyester) can help you to remain dry. Make sure you eat before heading out onto the slops and stay well-hydrated. Take snacks and drinks with you. Listen out for weather warnings and do not go out on the slopes if a storm or a sudden severe drop in temperature is forecast. Take advice from people who know the area well and if you suspect someone in your group is suffering from hypothermia or frostbite seek immediate shelter and medical attention. Don’t ski on slopes that are outside of your skill level and do not go off-trail. Always obey trail closure and other warning signs. Ski or ride with a partner. Young children should always be supervised and people with neurological problems should speak to a doctor before participating in high risk winter sports. Sadly, winter sports injuries happen all too frequently. Among the most common injuries are: torn knee ligaments; sprained ankles; spinal cord injuries; muscular strains; lower back pain; fractures; and ruptured Achilles tendons. If you, or a member of your group gets injured, seek immediate medical attention and do not continue skiing or snowboarding as you could cause permanent long-term damage. As specialists in treating sports injuries, we can advise on the best cause of treatment to get you back on your feet again.